Pacific Contract Sources, a customized hospitality furniture company were asked to help the Arizona Cardinals remodel their entire stadium. This is a five year, three phase remodeling plan. We at CAP Logistics got to be a part of the process by shipping the furniture for Pacific Contract Sources. We were excited to get the VIP area in place, just in time for the season to start! By Paul Garrimone In recent years, international trade has seen record numbers. In 2016, the total U.S. trade with foreign countries totaled $4.9 trillion – a little over half of that was imports, and, the remainder in exports. The U.S. and the European Union have continually remained in the top three countries in the world regarding exporting and importing, and, this is important in involving: capital goods, industrial supplies and commercial goods. Everything from: airplanes and automobiles; to pharmaceuticals and chemicals; to food and beverage; to semiconductors, electronics and computers; industrial machinery and equipment – even travel – all account for this international trade every second, of everyday. 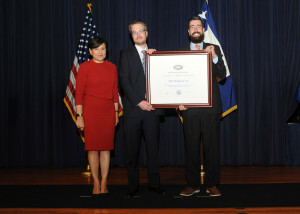 In 2016, the U.S. Secretary of Commerce Penny Pritzker presented CAP Worldwide with the President’s “E” Award for Export Service. The President’s “E” Award is the highest recognition any U.S. entity can receive for making a significant contribution to the expansion of U.S. exports. International shipping is crucial to the worlds overall economy and plays an important aspect to CAP Logistics and our customers. It’s interesting; however, to focus in on one important member of the E.U. and that country is Sweden. “Swedish massage oils, and the yummy and gummy delicious Swedish Fish candies alone account for probably over $100 trillion in imports and exports.” Our source, Bjorn Lyngstad stated to us (worth it to mention he is also a distant cousin to Anni-Frid Lyngstad, of the Swedish Pop Group ABBA). This is in fact completely made up, and, false. However, it is true that between the U.S. and Sweden, the annual bilateral trade in goods totals $25 billion annually. And, this doesn’t include the annual bilateral investments monies. Overall, Sweden is the 12th largest investor in the U.S. – creating just over 330,000 jobs across the country. Integral Swedish companies such as: Sandvik Group, SKF, Atlas Copco, ASEA Brown Boveri, Volvo and many others -- all have a hand in this partnership. Millions of years ago, dinosaurs trekked the globe in search of survival, and humans wouldn’t have stood a chance in their environment. In modern times, humans trek the globe in search of evidence of dinosaurs’ eventual demise in the form of fossils and other paleontological pursuits. When it’s time to get fossils from one place to another, CAP Logistics and CAP Worldwide are industry leaders in shipping these particularly historic and fragile items. For example, CAP Worldwide recently shipped a major find, an ankylosaurus, from Montana to the Royal Ontario Museum in Toronto. In general, once dinosaur fossils are removed from the ground, they are encased in hard plaster for transport. They are then carefully placed and secured onto a flatbed trailer before CAP Worldwide delivers the fossils to their new homes. What’s next on the journey of this ankylosaurus? In its lifetime at the end of the Cretaceous Period (68-66 million years ago), it might have measured up to 20 feet long, 6 feet tall and 13,000 pounds. In this case, it is now owned by the Royal Ontario Museum, whose crew will work to reassemble the find as fully as possible based on its condition at the time of discovery. This story not only illustrates how cool it is to see a dinosaur skull on the back of a truck, but it also illustrates the power of customer loyalty. CAP Logistics team member Mike Hoffman has been providing transportation solutions to this sector for several years, and he has customers who refuse to choose anyone else for their shipping needs. One of Hoffman’s customers, GeoDecor, has many fossils for purchase at the Denver Coliseum Mineral, Fossil and Gem Show, a popular public show going on now. GeoDecor president and CEO Tom Lindgren’s passion for paleontology has led to a renowned global career, including providing market valuations for the U.S. Department of State and royal families in the Middle East. Several of the GeoDecor fossils have been uncovered in southwestern Wyoming. Lindgren and his sons have quarries there. “What better legacy to leave one’s children,” he mused. This philosophy is very similar to that of CAP Logistics and CAP Worldwide founder Gayle Dendinger whose family businesses have likewise left a legacy. In related news, CAP Worldwide moved massive amounts of similar freight to over 68 countries during the Tucson Gem, Mineral and Fossil Showcase. Colorado Business Roundtable featured the Denver Gem and Mineral Show (across the street from the Denver Coliseum Mineral, Fossil and Gem Show) earlier this month on its Connect and Collaborate radio show, and the podcast is available. The rock shows are free, open to the public and will be in Denver through this Sunday, September 18, 2016. Don’t miss this chance to see and own your own piece of the fossil record. On May 16, 2016, U.S. Secretary of Commerce Penny Pritzker presented CAP Worldwide with the President’s “E” Award for Export Service at a ceremony in Washington, D.C. The President’s “E” Award is the highest recognition any U.S. entity can receive for making a significant contribution to the expansion of U.S. exports. CAP Worldwide is an international logistics company with offices in Denver, CO and Houston, TX. 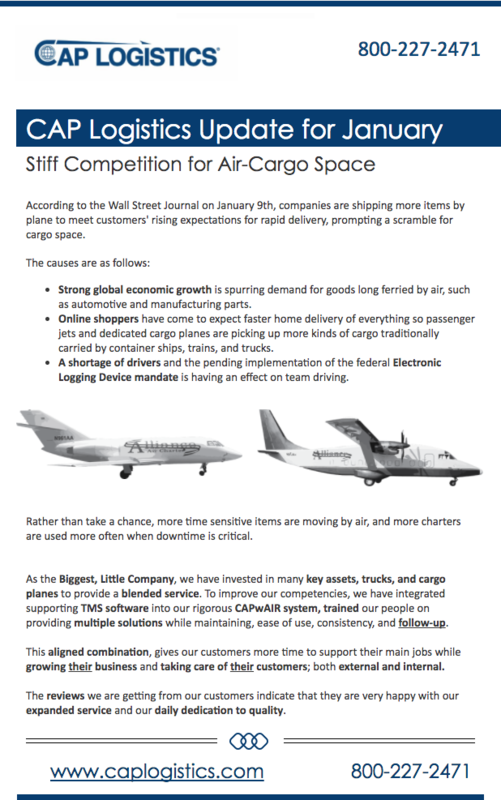 CAP provides international air and ocean transportation services to companies across the United States, and is known for providing exemplary customer service for standard shipments, as well as handling complicated and project shipments. In 1961, President Kennedy signed an executive order reviving the World War II “E” symbol of excellence to honor and provide recognition to America's exporters. This year, Secretary Pritzker honored 123 U.S. companies with the President’s “E” Award for their outstanding work to reduce barriers to foreign markets and to open the door to more trade around the world. Through its nationwide network, CAP Logistics learned about a great way to connect customers while supporting veteran workforce education and domestic agriculture. 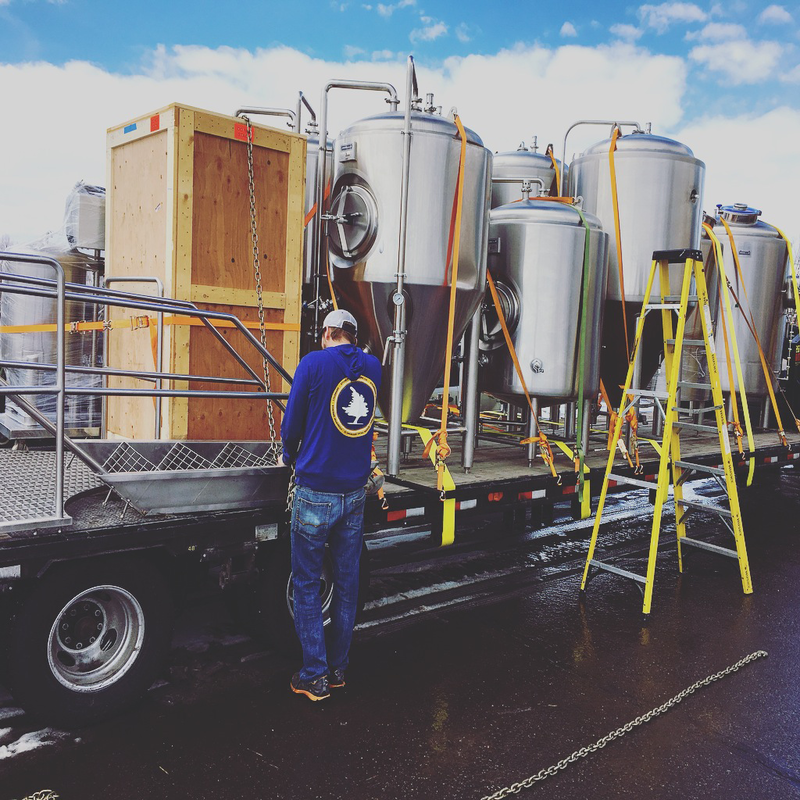 CAP Logistics recently donated a customized transportation solution to the Growing Veterans program, transporting a greenhouse from its manufacturer in Minnesota to a Washington State farm where military veterans are growing more than just food. Growing Veterans empowers military veterans to grow food, communities and each other. The nonprofit organization envisions an end the isolation that leads to suicide. It also seeks to make sustainable agriculture the norm. Growing Veterans currently operates three farms, but one of them was lacking a greenhouse which greatly limited its production capability. Leadership Skagit County, an intensive program designed to develop leaders at all levels of the community, partnered with Growing Veterans to help fundraise for the needed greenhouse. According to Leadership Skagit Team Blue Diamonds, the subgroup of Leadership Skagit leading this effort, its project goal is to “Raise That Roof” on a new greenhouse for Growing Veterans so that it can extend the growing season and provide a place for veterans of all abilities to heal, build community and grow delicious food. This goal involves not only fundraising but also building the structure. The greenhouse’s journey began in Minnesota at Poly-Tex, Inc., manufacturer of greenhouses and display systems. CAP Logistics loaded the new greenhouse and trucked it approximately 1,750 miles to its new home at the Growing Veterans Starbird Road Farm near Mt. Vernon, Washington. Kenny Holzemer, Development Director of Growing Veterans, said that the nonprofit organization "is so grateful to CAP Logistics for taking delivery our new greenhouse as it came off the production line in Minnesota, and delivering it to the very spot where it will soon stand. The greenhouse CAP has brought will provide year round opportunities for disabled veterans to fully engage in Growing Veterans' organic agriculture on our Starbird Farm in South Skagit County, Washington State.” Please check out the Growing Veterans website at growingveterans.org. Growing Veterans and Leadership Skagit Team Blue Diamonds are now in the process of assembling the greenhouse on a foundation. Volunteers have already “put up a good portion of it and will be coming together this weekend to finish the job,” according to Leadership Skagit Team Blue Diamonds Facebook page dedicated to this Raise The Roof project. Team Blue Diamonds reported that they are extremely close to the fundraising goal of $11,000. Petroleum refining company Tesoro donated $6,000 through its foundation, and that is how CAP Logistics came to hear about it. To learn more or to make an investment in veterans and sustainable agriculture, use this secure link at https://secure.qgiv.com/for/gwgv/event/770388/. Visit our CAP Logistics booth at IDEAS 2016 on May 4, 2016, at Port of Tucson, AZ. IDEAS 2016 is the 4th Annual Inter/Multimodal Development Expo Arizona-Sonora for mining innovation, multimodal transportation options and global business development opportunities. The Dry Fork Mine is in the process of conducting an Environmental Assessment (EA) to add leased, permitted federal coal to its mine plan. The scoping period for the EA has begun. Information about the project can be found at: http://www.wrcc.osmre.gov/initiatives/dryForkMineA2.shtm Anything you could do to help us get the word out and comments on the desired scope of the EA to OSM by April 8, 2016 would be greatly appreciated. Information about the permit activity and where to send your comments are below. The OSMRE is in the process of conducting an Environmental Assessment (EA) for the development of the Dry Fork Mine Amendment 2 area. This particular tract contains 33.4 million tons of coal in an area surrounded by industrial uses, coal mines and leased coal. The coal is needed to supply long term, low cost, reliable fuel to rural utilities in the region. Therefore, in addition to the significant tax and royalty benefits from mining the A2 coal, mining the coal will directly employ approximately 80 people per year, and keep electricity rates reasonable for those same local and regional residents. The Dry Fork Mine has an excellent record of strong environmental stewardship and providing significant benefits including safe, reliable and low-cost coal, good-paying jobs and substantial federal, state and local tax and royalty revenue. At a time when the main industries in Wyoming (oil/gas and coal mining) are suffering from a severe economic downturn, the ability to assure long term mining from the Dry Fork Mine is critical to the State and region's long term financial well-being. The Dry Fork Mine and its future are significantly integrated with the communities in northeast Wyoming. The benefits of the Dry Fork Mine to its employees and their families, and the significant economic activity it brings to the region has been demonstrated through years of responsible mining and reclamation. I urge the scope of the EA to heavily weigh consideration of the economic impacts of the mining operation on the State and local economies. Thank you for this opportunity to guide the scoping for the EA for the Dry Fork Mine A2 project. Congratulations to all the Denver Broncos and all the Broncos fans out there! Winning Super Bowl 50 is a major achievement, and we will certainly be celebrating here at CAP Logistics in Denver, Colorado. Before the celebrating though, CAP had one more call to field at the end of the game. Once again, the official supplier of sporting goods for the Broncos here in Denver called us for a dedicated overnight charter of Super Bowl 50 Champions Gear. After such a strong finish to a great season, Broncos fans will be needing a lot of shirts and hats to commemorate the event. On Saturday, December 5, 2015 Navajo Refining employees, their contractors and many citizens from Artesia, NM assembled and delivered 313 Christmas bikes to the Grand Heights Kindergarten. Ride for Bikes, a public charity, celebrated its tenth year in 2015 of providing bikes to children in southeastern New Mexico. During those ten years, Ride for Bikes has awarded bikes to children through CASA, Grammy’s House and Head Start in Artesia; Hearts Desire in Lovington; Head Start in Roswell; Head Start in Carlsbad; and Big Brothers and Big Sisters of Southeast New Mexico. For the past two years, every kindergartner in Artesia has received a new bike. More than 2,800 bikes have been provided to children through the generosity of donors and volunteers. In order to make it a more rewarding experience, the children had to earn their bike. The younger children made Christmas cards for our troops overseas or for the wounded soldiers in the VA Hospitals. The older children did more. One little girl who had long hair showed up to the bike presentation with a short bob. She had given her hair to Locks of Love. All of these children learned a powerful lesson of giving. The children receiving the bikes are not the only ones that learn lessons and receive gifts through this program. All who are involved walk away with a new sense of happiness, purpose, love and generosity. For the organizers of Ride for Bikes, the fact that the state football championship was on the day scheduled for the bike build was a huge concern. It takes a lot of hands to build 313 bikes, and we feared that many of those would be in Las Cruces. But, as always, the people of Artesia were not going to let the children down. More than a hundred people showed up to build bikes, air up tires and load and deliver bikes. It was a heartwarming sight to see so many families coming together to help children. There were familiar faces and newcomers among the volunteers, all of whom had so much fun that they are definitely coming out to help next year. Some of the people that showed up were 59 Navajo employees and 16 contractor employees that came out to help with the bikes. The Los Perdonados Motorcycle Club (LPMC) which has many Navajo employees as members manned the Inspection Section, where the bikes are inspected and repaired if needed. This group has been a part of the bike assembly since it started. CAP Logistics, Navajo’s transport contractor, worked hard to get trailers and flat beds onsite to transport the bikes. The assembled bikes were transported to Grand Heights where Principal Mitzi McCaleb had gathered up a team to unload and display the bikes in the gym. The 313 bikes took up all of the floor space and the stage. One mother stood in the corner with tears in her eyes. She said that the only thing her daughter had requested for Christmas was a new bike, but the family had not been able to afford one. She was so thankful that her daughter now had her Christmas bike. A new teacher that had transferred to Artesia from another New Mexico school was also teary eyed as she praised Artesia and said she had never heard of such a program anywhere else. On Monday, December 7, the kindergartners were told there was a big surprise waiting for them in the gym. As the children streamed into the gym, their eyes grew large at the sight of 313 bicycles. Many of them asked, “Do I get one?” When told that these bikes were a gift from the community, there were a lot of “wows” from the children. Ride for Bikes depends on the generosity of the citizens of the Artesia area to continue providing bikes for children. Your donation now will help us continue making Christmas wishes come true and providing the children of Artesia a healthy activity. Please visit our website www.RideForBikes.com to make a contribution online, or mail your check payable to Greater Artesia Foundation with “Ride for Bikes” in the memo to P.O. Box 1344, Artesia, NM 88211-1344. Pictures of this year’s bike build and giveaway will be posted on the website at some point. It is a good feeling to do good for others. Ride for Bikes would like to thank everyone involved and wishes everyone a Merry Christmas! “Our nation’s economy depends on a safe, efficient surface transportation system, and one of the Transportation committee’s priorities is to address the needs of the system,” the chairman said on Oct. 14. “Next week, the committee will move forward with the policy and authorization provisions of a bill to improve America's surface transportation infrastructure, reform programs, refocus those programs and national priorities, provide more flexibility and certainty for state and local partners and welcome innovation,” Shuster stated. The Senate passed a six-year highway bill (H.R. 22) in July that includes a $46 billion transfer of general funds to the Highway Trust Fund that would be balanced by decreasing the Federal Reserve's dividend payments to member banks and supporting the sale of crude oil. Originally published here by Colorado Business Roundtable.